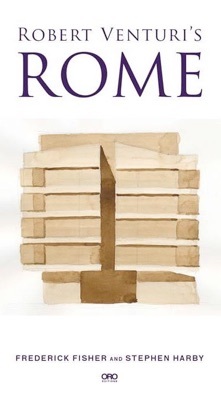 Venturi’s Rome is a guidebook to the city of Rome seen through the eyes of Robert Venturi, re- interpreted by two subsequent Rome Prize fellows and architects, Frederick Fisher and Stephen Harby. Venturi looks at architecture, landscape and art as different manifestations of common themes. The book was fundamental to the development of our outlook on architecture when we read it as undergraduates. Many buildings illustrated in Venturi’s book are located in Rome. From the Pantheon through works by his favorite artist, Michelangelo, and on to 20th century buildings by Armando Brasini and Luigi Moretti, Venturi reveals a complex and contradictory Rome. 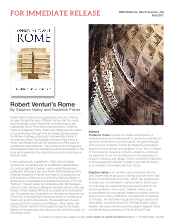 We propose to take the reader on a journey through time and ideas by visiting and discussing thirty-three Roman buildings in ten chapters that exemplify the revolutionary ideas of Venturi’s book. Interspersed with Venturi’s ideas are our own, drawn from our practice and observations as architects. In that sense the book will be an essay, and it will incorporate Venturi’s vision with our view of the way we humans live in a fragile relationship to nature, with our houses figuratively and sometimes literally built on ruins. Venturi’s Rome is a slim volume of fewer than 100 pages, full of water color illustrations painted especially for this book. Venturi illustrated his book with small black and white photographs and drawings. Artist Stephen Harby is creating imaginative and analytical watercolor illustrations for Venturi’s Rome to replace Venturi’s black and white images. A selection of these works in progress are shown below.